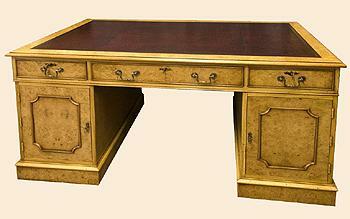 Partners Desks enable two people to work at the same Desk. 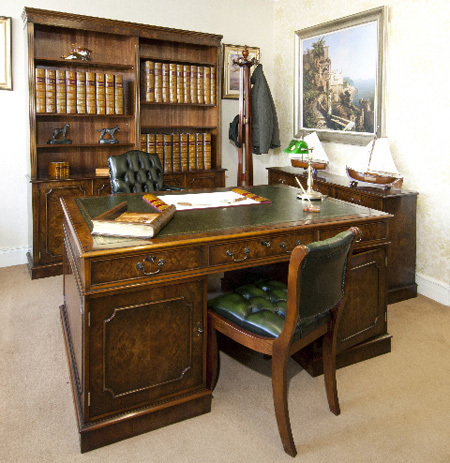 They can also make a Desk more usable if positioned in the middle of a room, giving additional storage in the form of extra drawers and cupboards. The two popular options are. Option A - Eight drawers on the front side ( including a Double Filing drawer ) Three top drawers and two cupboards on the partners reverse side. 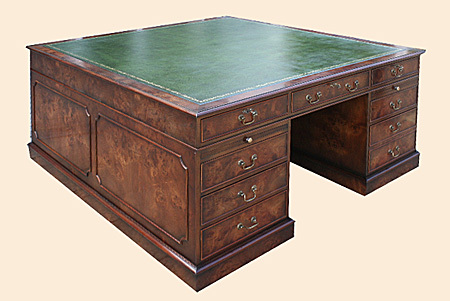 Option B - DC020 6ft x 4ft Burr Walnut Partners Desk . 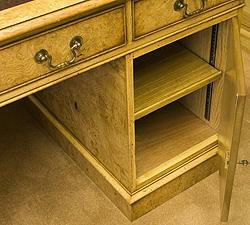 ( Drawers repeated front and back ) Note, The optional two brass cables holes fitted in centre of leather top for PC cables. 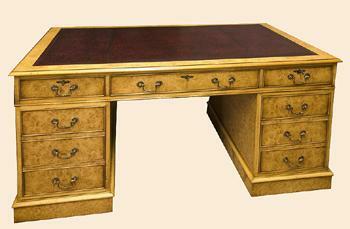 Premier Range Partners Desk ( rear view ) Burr Elm finish. 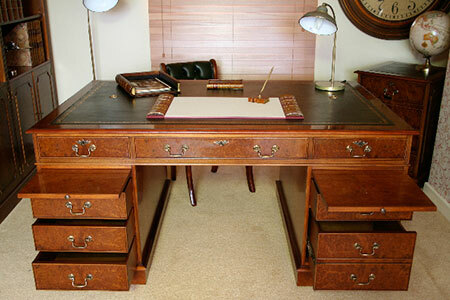 Note, the optional, Round Brass Cable management holes, fitted into the leather top. 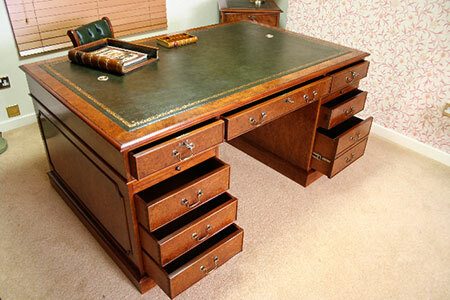 We have made many Bespoke Partners Desks for customers over the years. 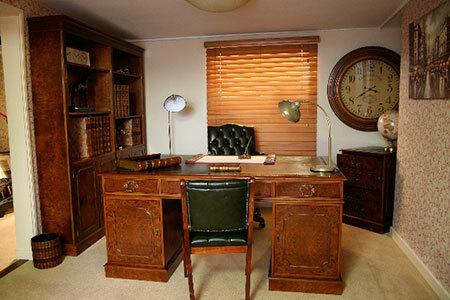 If you have a certain size and specification for a Partners Desk, please contact us for a free quotation. 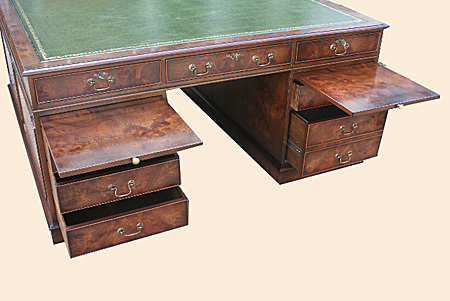 Special size 6 ft (183 cm) x 6 ft (183 cm) Burr Elm Partners Desk. 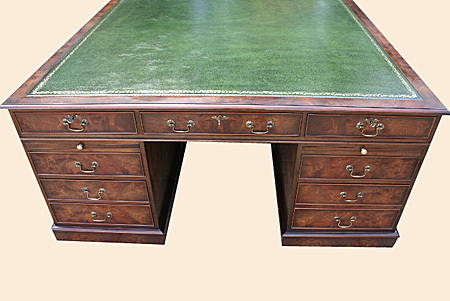 Green Hide leather top. Optional Brushing Platform slides fitted. 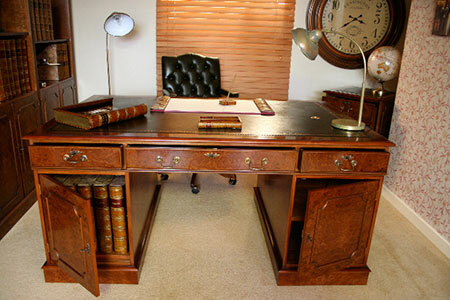 Option A - New size 5 ft 6" ( 176 cm ) x 3 ft 6" ( 107 cm ) Burr Walnut Partners Desk . Options fitted include, two round brass cable management holes in the leather top and a pair of pull out Brushing slides.